Antique lamps run the gamut from old farm lanterns to the beloved Tiffany lamp and its successors. Many of these lamps, whether electric or oil, can still be used today. Converting an oil lamp to electric can reduce the value, but because these are among the most affordable antiques, many owners prefer the pleasure of using it with the increased convenience and safety of electricity. Up until the spread of gas lighting and then of electricity, all lamps operated on the same principle: a reservoir to hold oil and a wick to control how quickly it burned. Probably the first lamp was invented when somebody noticed that oil-saturated fabric can burn steadily over a long period of time. According to BibleHistory.com The earliest examples of lamps were made of clay and shaped by hand. These were prevalent through the Bronze and Iron Ages up through the Greek period (around the 6th century BC). During the Greek period through the Middle Ages, they were made from molds as well as by hand. The first metal lamps appeared around the first century AD. The very earliest examples are generally plain, but later pieces became much more elaborate. The bodies were often shaped like human or other figures and the decoration became much more ornate. Over the years, lamp designs became more refined and as the craft of glass-blowing spread, the flames were shielded from drafts and the risk of fire was reduced by adding glass shields. Metal had replaced pottery or ceramic bodies. However, lamps were still more common in areas where oil was plentiful. The crusie lamp was probably invented during the 1600s. Because wicks drew up oil faster than it could burn, they dripped and wasted oil. The crusie lamp had a second reservoir to catch these drippings. During the 1700s, an inventor came up with an improvement that allowed oil from the wick to drip back into the reservoir, saving what was otherwise wasted and making oil lamps much more economical. It also included a cover to reduce spills and control the oil. This design, the "betty lamp," (from the German for "better") is one of the most popular antique lamps. The next major improvement was the central draft lamp, invented in 1780 by Aime Argand, which used a cylindrical wick and chimney to maximize air flow around the wick, thus making the light brighter, and also included a mechanism for easily raising or lowering the wick to make it burn more or less. Central draft burners are characterized by a central intake tube that is surrounded by a wick. Oxygen is provided by perforations in the sides and top of the burner. The light provided by these was of a much brighter quality that the light provided by lamps prior to this time. Although there were many makers of this style of lamp Coleman, Rayo and Aladdin were the most well known by the late 1800s. The invention of gas lighting in the early 1800s and of kerosene in 1853 virtually wiped out the use of candles as lighting devices. Electric lighting surpassed both of these at the beginning of the 20th century. 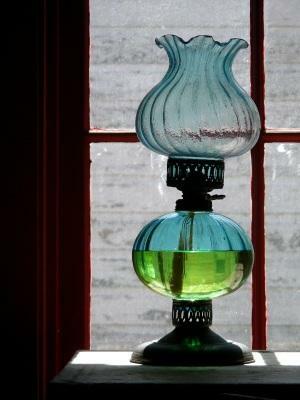 As the arts of glass molding and metalwork became more advanced and fuels like gas, kerosene, and electricity became abundant, lamps became much more decorative and no longer had to be designed just to maximize efficient oil use. Lamp shades and painted glass bulbs softened light and added color. This was a poular kerosene lamp design with swing arms and were designed to transmit the most light possible for reading. This was done by putting the kerosene reservoir out of the way of the actual lamp. Banquet lamps featured an upper and a lower globe, usually painted. These are also sometimes called Gone with the Wind lamps because they figured prominently in the set decor for the movie. Tiffany lamps featured shades made out of stained glass. Louis Comfort Tiffany was inspired to create these by the small pieces of broken glass left over from making stained glass windows. The Tiffany lamp revolutionized interior lighting and some of his original designs are still sold today. However, Tiffany Studios closed in 1933 and production of authentic Tiffany lamps ceased. These original lamps fetch thousands of dollars at auction. The earliest TIffanys were made from 1876 through 1879. They were made for kerosene and had hand blown shades. These have no resembelence to the popular lamps that he created later. Gas lamp fixtures are frequently converted into electric lighting today, as are kerosene lamps. You can buy these converted lamps as well as those in completely original condition in many antique shops or on the Internet. Antique lamps create a vintage ambiance in any room. Do check to make sure that any electric lamps, or those that have been converted to electricity, have cords that are intact and safe. Check for fraying and small tears and have these repaired before use.